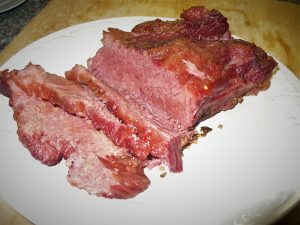 Use this brining recipe to make corned beef with or without pink curing salt that contains sodium nitrite. Sodium nitrite gives cured products such as corned beef brisket its characteristic pink color and flavor. If making corned beef without sodium nitrite, the meat will be gray as for any roast meat and the flavor will be slightly more pickled than sweet. For more information about curing corned beef brisket as well as wild game, read about brining and curing corned beef and game meat. Pour the water into a large (6 quart) saucepan, and add the salt, sugar, optional curing salt, and picking spices. Place pan over high heat, bring to a boil, and stir until salt and sugar are dissolved. Remove from heat, cool 30 minutes. Transfer to non-reactive (glass or stainless) container and refrigerate uncovered several hours, or until well chilled. Place beef brisket in a large container or gallon size or larger zipper style bag. Pour the cold brine over the meat to cover completely. If placed in a container, the meat may float, in which case you want to weigh it down with a plate. If using a zipper style bag, be sure to extract the air and seal the bag completely; place bag in a pan or other container in case it leaks. Place the brining container in the refrigerator for 4 to 7 days (2 days per pound of meat). Twice a day (every morning and every evening) flip over the brisket to ensure the curing meat brines evenly. 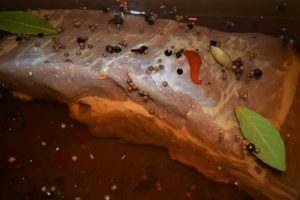 At the end of the curing period, remove the brisket from the brine. Rinse under cold running water and remove any spices that have stuck to the surface of the meat. Discard the brine. After curing, the meat is still raw, so you must cook it before serving or using in corned beef recipes. Cook it by boiling or baking, as described below. 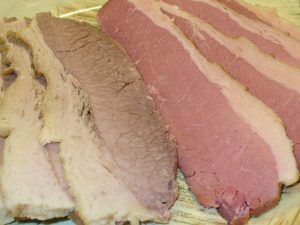 This brining recipe for corned beef brisket uses strong brine strength of about 15% (weight of salt to water), a modest amount of sugar, and optional curing salt containing sodium nitrite. To make homemade corned beef, one usually wants to use pink curing salt or American curing salt #1–a “fast” cure that contains sodium nitrite. Sodium nitrite preserves cured meat by prohibiting the growth of spoilage bacteria (especially deadly C. botulinum) and preventing fats from going rancid. But nitrites also give products like ham and corned beef brisket a characteristic pink color, as well as contributes desirable flavors. For more information about curing meat, read about brining and curing corned beef and game meat. Place cured and rinsed brisket in a heavy saucepan or Dutch oven just large enough to hold it snugly. Barely cover with cold water. Instead of water, you may use apple juice, hard cider, or dark beer such as porter or brown ale. Place pan over high heat and bring to a boil. Reduce heat to a simmer, cover pan, and simmer gently for 3 hours. While corned beef is cooking, check every 30 minutes and adjust heat as needed to maintain a very gentle simmer. To serve warm, remove to a warm platter and allow to rest 10 minutes before slicing. Place the meat fat side up in a covered pan in a slow oven with a little liquid. Pour 3/4 cup or 12 ounces water into the pot, or enough to a depth of about 1/4-inch. Instead of water, you may use apple juice, hard cider, or dark beer such as porter or brown ale. Cover the pot with a lid or aluminum foil and place in the oven. Bake at 300°F for 3 hours, or until the corned beef shrinks by almost half and is tender when pierced with a knife. Traditional corned beef dinner accompaniments include per person, 1 medium peeled potato, ¼ head cabbage, and 1 large peeled carrot. The vegetables can be added to either cooking method during the last 30-40 minutes, or baked or steamed separately and served with the corned beef. Arrange the cooked vegetables around the sliced corned beef on a large platter. A four to six pound corned beef brisket will feed 8-12 people for a traditional corned beef dinner, or four to six people with plenty of leftovers for classics such as corned beef hash and Rueben sandwiches.